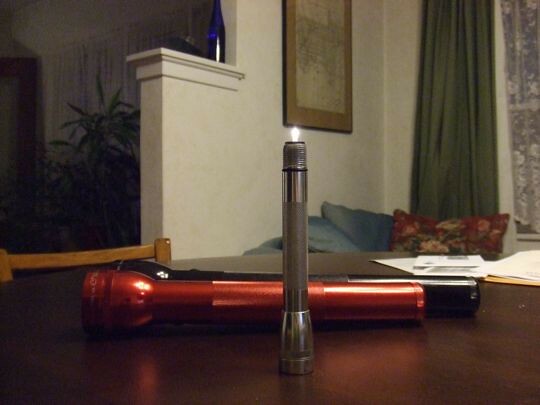 If you are a flashlight aficionado (I also didn’t know how to spell that), than you already know this handy trick of the mini-Maglight. Unscrew the top part, put the handle inside and viola’ – instant candle. This picture’s for you, Peggy. I have a very cool Russian flashlight -- no batteries. You squeeze repeatedly on the handle and it generates enough of a charge to illuminate the darkness for a couple of minutes. I think I only have two flashlights. And I’m not sure where they are. I should get a new one today. I LOVE IT!!! Thank you Lauren!! I’ll play with that picture all day! Yippee! Flashlights are like scissors in my house. There’s ‘the good’ one…if you’re lucky enough to find it. And then there’s the cheapy ones…for some reason those can always be located, but are usually dead. I don’t have one in my car…stupid me…I’ll work on that & I’ll work on preparing my house for the Zombie attack…which means I’ll need clean sheets, extra toothbrushes, a few board games, and lots of pasta. I have a Maglight that I need to show you. I’ll bring it to NE. Because I did not check my Maglite batteries every month, like the company wants us to, I sent it in under warranty to have the corroded battery removed. Instead, I was sent new batteries and a check, which I applied to a replacement. The replacement lacks the heft of the old flashlight. So…….., one more project for the first of the month? Every month? I did not know that. Dang. I wonder when they’ll be making flashlights out of aluminum foil.